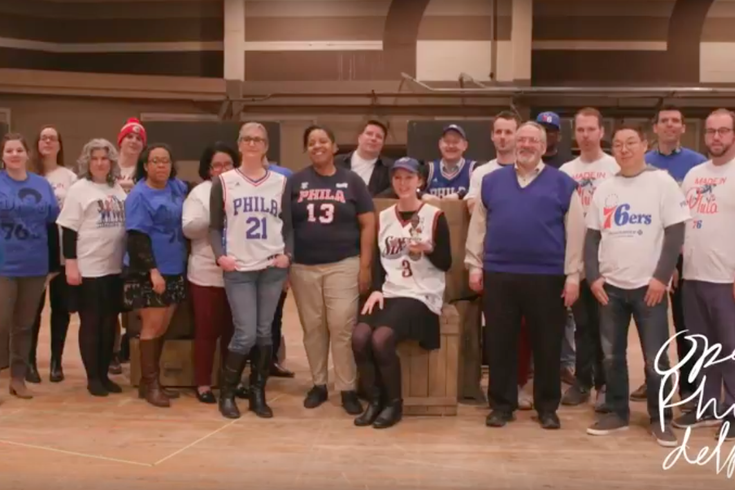 Opera Philadelphia Trusts the Process. Back in January, I ranked the "fight songs" — if you want to call them that — for each Philadelphia sports team. I put "Here Come the Sixers" lower than I wanted to; not because I don't love the song or because it doesn't hype me up, but because it had been dormant for about two decades. There was no recent history of sustained success to pair with the 70s-style jam, and a New York Times profile didn't change that. We may be past that caveat. The Sixers are gliding into the postseason on a 16-game winning streak as the third seed in the Eastern Conference and have a young core that looks to possibly contend for the next decade — at least. But the real indicator for when a fight song starts becoming transcendent is when it's covered in creative ways. "Fly Eagles Fly" has been done a million times in a million different genres at this point (or at least it feels that way). With that in mind, here are singers from Opera Philadelphia, performing "Here Come the Sixers" ahead of the team's home playoff game against the Miami Heat on Saturday. I feel like I'm floating on a cloud down Broad Street to the Wells Fargo Center. Trust the Process.